The following report is an extract from Harley Lawer's excellent book: "Argyle Classics" published by Green Books, Plymouth (ISBN: 0951381709), and is reproduced with his kind permission. 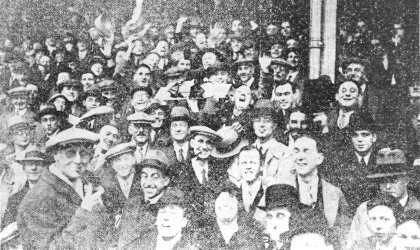 Above: Railway staff and supporters raise their hats to give the team a rousing send-off on their departure for London. Below: Fans arrive with a large decorated pasty. Captains Leslie and Parker shake hands. 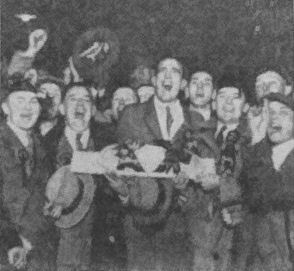 Well, the famous cup-tie is over at last, Plymouth Argyle have been beaten by the Arsenal at Highbury by four goals to two, and that's that! You who were not fortunate enough to see this great struggle may be saying to yourselves "Ah, well, four goals to two is decisive enough, anyhow." Well, if that is what you are thinking get the idea out of your heads at once. If there is a more unfortunate side than Argyle - Stay, we must be very careful, else we shall be charged with looking for excuses. No excuses need be sought. We'll just stick to the bare facts. Let me say at once that if Argyle had won we should have thought they had deserved it for a very gallant fight. And if they had drawn we should have been saying to ourselves "A very fair result, but we might have won." But as they lost I'll not tell you just exactly what that vast crowd who went up from Plymouth were saying about it in London last evening. I will say, however, - and very emphatically too, - that this match will be remembered for all times as a game of criticised decisions. There were several but two of them altered the whole trend of the game, and that's why Arsenal won. That's the reason, and that alone. This, by the way, is not only my own opinion. I sat watching the game surrounded by a small army of London Pressmen, who do not jump to hasty conclusions. And as each of the two vital incidents which so materially affected the result arose they were emphatically of the opinion that Argyle had every reason for complaining. What a wonderful cheer after only five minutes for that goal from Vidler after a glorious drive from Leslie had struck the bar. There were 65,386 people on the ground - more than a thousand more than have ever been to Highbury before - and I should imagine about 60,000 of them opened their lungs. Yes, they were very impartial. It certainly seemed to me that the vast majority of them wanted Argyle to win. We must admit, however, that during the next quarter of an hour or so the Arsenal had some cruel luck. The Arsenal keeper tips a shot from Bowden over the bar. Time after time they surged around the Argyle goal and the uprights and crossbar were struck three times. Yet the Argyle forwards always appeared to carry the greater danger, and there were two incidents in the Arsenal goal area that might have turned out differently. 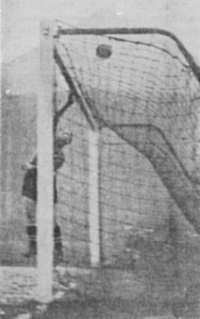 In the first place Black struck the underside of the crossbar but the ball fell inches in front of the line instead of beyond it. Then Vidler had a glorious opening five yards out, but in trying to control a spinning ball he trod on it. We were having thrills every minute. Parker once bowled Black over very heavily and there were loud shouts for a penalty. But they were not nearly so loud as when John later pulled the ball down with his hands inside the area. Unfortunately for Argyle, the referee did not see it. You will see that Arsenal were not having it all their own way, even though much of their approach work was extraordinarily clever. Then, however, when we were saying to ourselves that the people in Plymouth would be driven frantic by the news that Argyle had a half-time lead. Then came tragedy No. 1. 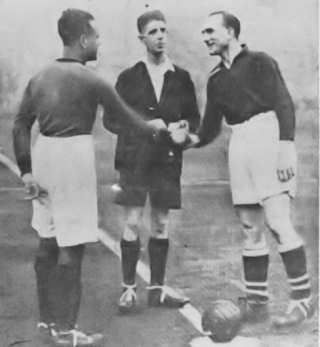 Alec James, that wonderful bundle of football wizardry who was the Arsenal's outstanding star, fell on the halfway line with the ball beneath his knees. He was there for several seconds trying to scrape the ball away, and then Pullen played the ball - quite legitimately in the opinion of Arsenal. But a free kick was awarded for a foul. The ball was booted towards the Argyle goal and Lambert, standing with his back to Harper, flicked the ball into the net with the back of his head. At half-time we were feeling a trifle sore, but still confident that Argyle might pull it off. A minute after the restart, however, Pullen was carried off. Two minutes later Reed was also carried off with a badly cut head. Pullen quickly returned, but Reed was away ten minutes, to return with a heavily-bandaged head and face. A small section of the many thousands of Argyle supporters who travelled to Highbury. Did Argyle start to crack under this handicap? Not a bit of it! Instead, they seemed to play with more inspiration than ever before. And, believe me, with only 20 minutes to go, the Arsenal were a badly rattled-side. We were seeing the real Argyle now. Londoners were rubbing their eyes with astonishment. Their "Stock Exchange" team - a new name this to me, but I often heard it - were being outplayed, and very, very decisively, too. Their defence seemed all of a heap, kicking the ball here, there, and any old where for temporary relief. We were now saying to ourselves that Argyle were going to humiliate them after all. Naturally we did not expect a Second Tragedy. But it came, all the same. Arsenal took the lead for the first time. But what a goal! From some close interpassing the ball was pushed through the Argyle backs to Lambert a yard or two behind them, well offside, but he went on and netted. The goal was allowed, and everybody was flabbergasted. Four minutes later, the Arsenal got another goal, but within a minute Argyle, striving gallantly, again scored a second through Leslie. We still hoped they might force a replay. Then, eleven minutes from the end, Harry Roberts put through his own goal from the edge of the penalty area in attempting to lob the ball back to Harper. One consoling feature about the game is that it was watched by more people than have ever been on the Highbury ground before - 65,386, who paid �4,539 18s., which will provide a very nice little nest-egg for Argyle. 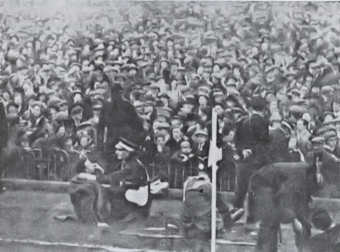 Many became stretcher cases after fainting in the packed crowd. Half-an-hour before the start the gates had to be closed, and the Arsenal management telephoned to the Underground Railways asking them to stop any more bookings, except for those people who had reserved seats. Before the game there were some amazing happenings on the high terraces behind each of the goals. Packed masses of humanity swayed dangerously time after time, and it really looked as though someone might be seriously hurt. There were fainting cases galore, and the crowd was so dense that it was impossible for the ambulance men to get to them. Consequently people on the higher part of the terraces who fainted had to be lifted over the heads of the crowd, and bundled - there is no other word for it - unceremoniously down to the playing area, still over heads of the crowd all the time. At least one man had his leg broken in this way, and it looked as though others must have been injured as well. Arsenal - Moss, Parker, Hapgood, Jones, Roberts, John, Hulme, Jack, Lambert, James, Bastin. Argyle - Harper, Roberts, Titmuss, Mackay, Pullen, Reed,. Grozier, Bowden, Vidler, Leslie, Black. Scorers: Arsenal - Lambert (2), Hulme, Roberts (og); Argyle - Vidler, Leslie. Referee: Mr T. J. Botham (Walsall). � Arsenal did not concede another goal until they reached the final, losing 2-1 to Newcastle United at Wembley.